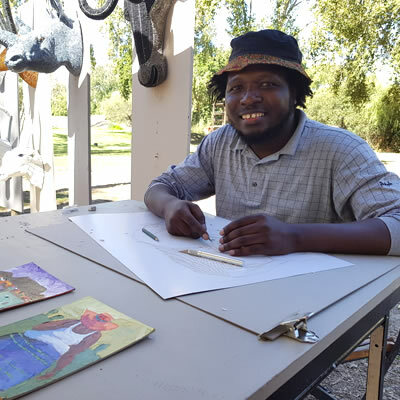 Kuda Gavi has two styles of painting on display at the Craft market at Spier: small colourful acrylics of African scenes and people, and a second very different style evolved from print-making techniques in oil on paper, depicting African animals in movement. Tell us about your wildlife paintings? My animal paintings use a technique derived from print-making. I work on double layer paper. I do the drawing, then cut out and peel off the top layer according to the design and then paint over with oil paints, which gives a 3D effect. They are one-off pieces. I can do a similar piece but it won’t come out the same, the patterns are all different. My inspiration comes from nature and animals. The movement, animals running where you can see the muscle, I enjoy that. I don’t necessarily use the real colours of the animal. Sometimes for example I use blue on the giraffes although I’ve never seen a blue giraffe! It adds another dimension when it doesn’t have to be hyper realistic, It’s contemporary. I started as a young child, doing cartoons, and then started copying family pictures. In primary school my teachers saw I had an interest in art so anything that led to drawing they would give to me. In high school my art teacher played a pivotal role. He used to take me to art workshops, studios, exhibitions using his own money. I’ll never forget him. My mum didn’t want me to pursue a career in art, she wanted me to join the army. I used to work in the holidays in a supermarket and I’d saved quite a bit of money. So when I finished high school, I enrolled in a community art school, which my art teacher introduced me to. I paid for my first six months of art training, but then after that I had no more money, so I had to go to my family members to beg them to speak to my mum, to say you need to support your child. One of my uncles managed to get through to her – he told her, “This is his passion, he won’t fail. He will push himself because it is something that he loves.” So she actually gave in and started supporting me. When I finished the course I entered my first group exhibition with the Visual Artists Association of Bulawayo. At that time the Director of the National Art Gallery was on a drive to support young artists. My work was hand-picked and I was given sponsorship and a studio space at the gallery premises. So I became a resident artist there for three years. My art started to become more professional. These smaller acrylic paintings became my style when I was still in Zim. Tell us more about your acrylic paintings? I use acrylics and a palette knife to paint small pieces picturing township scenes and women and children. In my acrylic painting I always paint the women from the back, the reason being that I don’t use their facial expressions to tell a story. I want to use their body language and movement, that and the boldness of colour. See Kuda’s work at The Craft Market at Spier. Open10h00 to 17h30 every day until beginning May 2019, then closed for winter until new season opens end September 2019.